The basking shark (Cetorhinus maximus) is currently one of the three known sharks, together with the shark great mouth (Megachasma pelagios) and to the whole shark (Rhincodon typus), that swims with the wide open mouth filtering thousand of liters of water every time, to extract the plankton of which he feeds. No bloody attacks and any outfit of great teeth for take the offensive, but only a pacific swimming with open mouth, "tasting" the plancton of the sea, without any apparent effort. The basking shark swims both in coastal waters and in deep waters, solitary or also in numerous groups. Not rarely little bottom the surface of the water is sighted, while it is moving him to reduced speed and with the wide open mouth. This fish is the greatest of the Mediterranean and is signalled anywhere in this sea, except in the south-oriental coasts. In the Italian waters it swims especially in the Tyrrhenian and in the middle-low Adriatic. It is also present in the oceans Pacific, Atlantic and Indian. The basking shark can arrive to a maximum length of around 10-13 m, with a weight next to the 10 tons while the middle ransom seems to stay around the 3-5 m.
The dimensions of the small ones don't be known at the birth, the smallest captured sample had a length of 165 cm. There aren't certainties about the reproduction of this animal, probably viviparous without placenta. The period of pregnancy would finally result very long, even up to three years. Despite his massive structure the basking shark is absolutely harmless for the man and in fact he easily allows to approach and to photograph. Unfortunately, perhaps really for this "meekness" and for his redoubt speed in the swimming, this shark is intensely chased and today he is considered even a kind in danger of extinction. The young samples of Cetorhinus maximus have the face very lengthened, similar to the trunk of an elephant. In adult age however the face becomes shorter and rounded off and the proportions of the head return in the norm. In this shark the back is dark grey, thin to reach the brown, while the abdomen is clearer. On the face and on the abdomen clearer stains can be present. The eyes are small and there are present, between them and the first gill slit, the spiracles. The dorsal fins are two, the first one very great, tall and triangular, that can lose tone during the mature age and can present "made flabby" on the back. The second dorsal fin is very smaller and behind. The pectoral fins are long and great and finally the caudal fin is almost symmetrical. 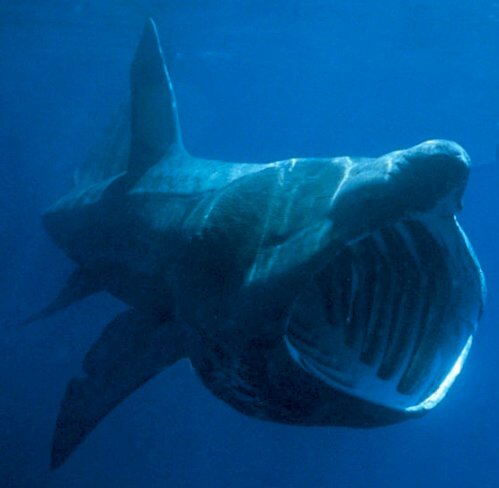 The basking shark has five gill slits, very ample, they almost surround the head of the animal and they are dressed of numerous called filaments, long up to 10 cm, that have the function to filter the water (up to 9000 liters an hour) and to trap the plankton of which the shark feeds him. Sometimes the enormous mouth is closed and the bit is swallowed..
During the winter the filaments are probably allowed to fall for being replaced and the animal would begin a sort of hibernation, fasting in deep waters and exploiting the resources accumulated in hisenormous liver. It is easy to understand that the biology of the basking shark introduces today still many dark sides, being a lot difficult to study this shark in his natural environment..
Plankton: animal and vegetable organisms, of small and microscopic dimensions, incapable to oppose themselves to the movements of the tides, therefore without complete autonomous movement. Sharks reproduction: around the 30% of the sharks has a oviparous reproduction, that is when the female deposes outside the eggs; around 50% has a aplacental viviparous reproduction, that is when the female produces the eggs that develope inside her body and the small sharks go outside completely formed; the remained 20% has a placental viviparous reproduction, that is when the embryo is in contact with her mother through a primitive placenta.